Katsuyu (カツユ) is the slug queen summoned by Tsunade. The name Katsuyu apparently comes from Slug (蛞蝓) in on'yomi. PersonalityCompared to Gamabunta and Manda, the summons of Jiraiya and Orochimaru, respectively, Katsuyu is quiet and more subservient to her master. She addresses Tsunade with the highly respectful honorific "-sama," and in the English versions, uses Mistress, or Milady. Katsuyu tends to also use honorifics like "-kun" and "-san" on other villagers. Sakura and Shizune show her considerable respect, addressing her as "Katsuyu-sama". edit Part I Search for TsunadeAfter Tsunade heals herself from what should have been a fatal attack, all three Sannin decide to use their most powerful summons and all three succeed at the same time. Katsuyu is summoned and was nearly squeezed to death by Manda, escaping by using her Slug Great Division. Mondai and PocchaShe is summoned again in episode 161, a filler episode, to mess with Mondai and Poccha, a pair of outsiders impersonating Might Guy and Rock Lee. In this instance, she had a cold and sneezed acid which Mondai and Poccha, along with a clueless Naruto, were forced to anticipate and assist (although it is entirely possible that she was faking the cold in order to help Tsunade make Mondai and Poccha's lives miserable and prevent them from having the time to gather any information). Part II Three-Tails Arrival arcFearing that Shizune's team would need further assistance to seal the Three-Tailed Giant Turtle, Tsunade sent Katsuyu to aid them. Four divisions of her appeared in time to help the sealing team by giving them an extra supply of chakra. Ino and Hinata, who do not recognize Katsuyu, are initially alarmed, but Sakura explains who she is to them. Pain Invasion arcWhen Pain began attacking civilians all over the Leaf Village Tsunade summoned Katsuyu. She then told the Giant slug to take her chakra and heal the injured all over the village. When Pain uses Shinra Tensei to destroy Konoha, Katsuyu surrounds all the villagers to protect them from the blast and heal their injuries. When Naruto returns to Konoha, Tsunade orders one of her small divisions to stay in Naruto's pocket and inform him of Pain's abilites. Other Katsuyu divisions inform the villagers of the situation and help facilitate communication between them; Shikaku asks the division nearest to him to have the other divisions find out what they can from all the ninja who fought Pain. After Hinata Hyuga is stabbed and Naruto loses control of himself to the Nine-tailed Fox, the division on him observes this and reports the events to all the ninja in the village. 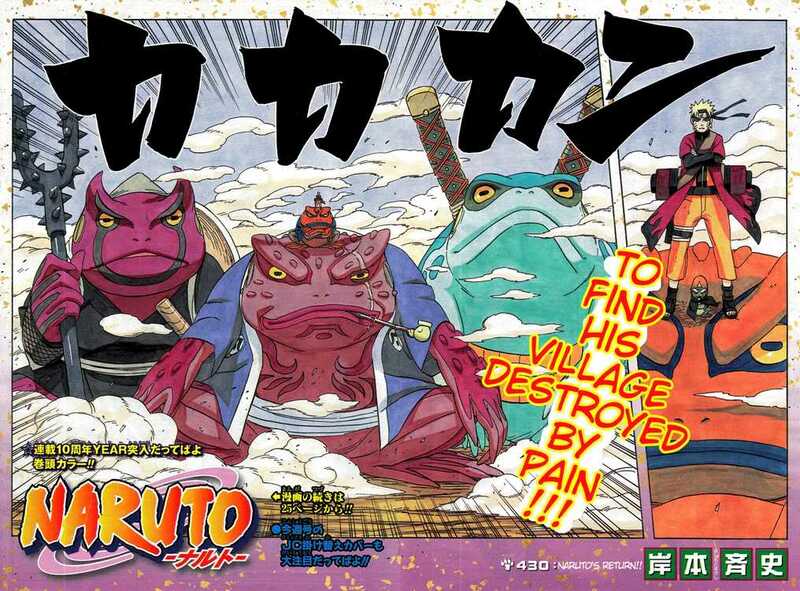 The division on Naruto survives his transformation, and tells him that he did not harm Hinata or any of the other villagers while under the fox's control, greatly relieving him. After Pain's defeat, Katsuyu informs Sakura, Hinata (who had just regained consciousness) and Team Guy of Naruto's victory, and tried to tell Neji that Naruto did not want help, but Neji insisted that Katsuyu show them to Naruto. Katsuyu spits a potent acid from her mouth capable of melting through boulders. Using this jutsu, Katsuyu is able to divide herself into smaller slugs; by doing so, she can escape harm. She can then reform herself by combining her clones once more. This technique is a more violent form of Katsuyu's Tooth Tongue Sticky Acid Technique. Using Katsuyu as a chakra gaurd, Tsunade forms hand seals and places her hands to Katsuyu's head. Chakra runs through Katsuyu as she releases a powerful trench like blast powered with Tsunades chaka out of her mouth. This acid can cause severe burns to a target.